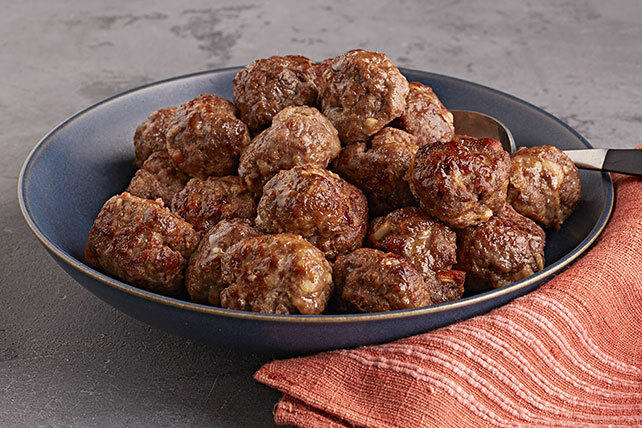 Why serve up meatballs that are too big or too small when you can make meatballs that are juuuust right? Read on to see how it's done. Add milk to bread in large bowl; stir to evenly moisten bread. Let stand 1 min. Add remaining ingredients; mix just until blended. Pat into 8x4-inch rectangle on work surface; cut into 32 cubes. Roll each into ball; place on foil-covered rimmed baking sheet sprayed with cooking spray. Bake 16 min. or until done (160ºF). Add 1 tsp. dried basil leaves or dried oregano leaves to meat mixture before patting into rectangle on work surface. Bake meatballs as directed; cool completely. Place in freezer-weight resealable plastic bag; freeze up to 3 months. Thaw in refrigerator, then reheat before serving. Line 8x4-inch loaf pan with plastic wrap, with ends of wrap extending over sides. Prepare meat mixture as directed; press onto bottom of prepared pan. If you have a second 8x4-inch loaf pan, cover meat layer in pan with plastic wrap. Top with second pan, then press bottom of pan to flatten meat mixture. Remove second loaf pan. Use ends of plastic wrap to remove meat layer from pan. Cut into 32 cubes, then roll each cube into ball.